Monastery of the Nativity of Our Lady was founded in 1398 on the shores of Lake Borodavo, twenty miles north-east of the Cyril-Belozersky Monastery. Its founder, the Rev. Ferapont (1337-1426), was a monk in a monastery in Moscow Simonovsky and associate of St. Cyril of White Lake. The monastery was painted by Dionysius, assisted by his sons, for 34 days. About 400 years the monastery was one of the leading cultural and religious centers Belozersky edge. In 1798, by decision of the Holy Synod, the monastery was closed and converted into a parish church. In 1904 the monastery was re-opened as. In 1923 the monastery was closed. Now in its walls is a museum of frescoes of Dionysius. Cyril-Belozersky and Ferapontov monasteries are closely connected with each other right from the origin. The founder of the Ferapontov Monastery monk Ferapont arrived with Cyril on Beloozero of the Simonov monastery in 1397 and settled with him on the shore of Lake Siverskoye. However a year later he moved away from Cyril and founded his monastery twelve miles to the north-east of the Kirillov, in a beautiful location, on a small hill between lakes Borodaevskim and Pasco. Ferapont Beloozero stayed on for long: 10 years later he was summoned by Prince Andrei Dmitrievich, the younger brother of the Moscow Grand Prince Vasili in Mozhaisk for founding the new monastery, known as Luzhetsky. At the time of departure of the Ferapontov Monastery remained humble abode, numbering about a dozen monks and far inferior novice rich Kirillov monastery. More intensive growth of the Ferapontov Monastery began later, in the middle of the XV century, when they ran a prominent church figure Martinian. Enjoyed a reputation in church circles, he did not stay away from involvement in political. In 1447, Prince Vasily II the Dark visited the Ferapontov monastery and received the blessing of Martinian to march against Moscow Dmitry Shemyaka mastered. In gratitude for the support of Basil II ordered the transfer of Abbots Martinian Trinity-Sergius Monastery. Martinian man was enlightened. Since his abbacy Ferapontov monastery along with the Kirillov has become an important center of book publishing. Remarkably, the next episode: in 1489 the archbishop of Novgorod Gennady which to fight the heretics took rare at that time the church books, and sent them to the Ferapontov Monastery. Martinian, buried in 1483 in the monastery, and about 1550 sainted, along with Ferapont subsequently considered the patron saint of the monastery. From out of the Ferapontov Monastery and other major religious figures. With one of them, Bishop of Rostov Joasaph, who came from a noble family of Prince Obolensky in the past ferapontovskim monk, usually associated beginning of stone building in the monastery. Return left the chair of the bishop of Rostov Ferapontov coincided with a fire destroyed many monastic buildings. The resulting structure surviving stone Cathedral of the Nativity of the Virgin is hardly without its aid Joasaph, moreover, that there is a story that during a fire in his cell, miraculously survived a kind of "treasure", destined for monastic purposes. It is believed that it was Joasaph invited to the monastery to the cathedral paintings of Dionysius, the biggest artist of Moscow Russia. If the construction activities of the Ferapontov Monastery in XV - XVI centuries can not be compared with the grand construction of Kirillov monastery, still its magnitude at that time were significant. By the middle of the XVI century monastery has had a few stone buildings: the cathedral, refectory, of the Exchequer. 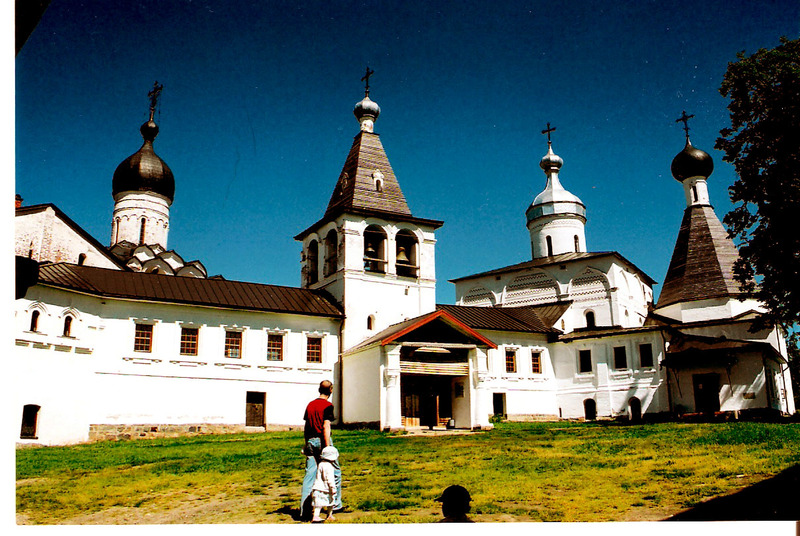 In 1614, when the Ferapontov Monastery captured Cossack detachments, it was built, were relatively small ruin. However, the economic decline associated with the Lithuanian invasion delayed further construction work for more than two decades. By 1640-th year is a short period of a new upsurge of the monastery, which caused a revival of stone construction. Following this, a gradual decline of the monastic economy. Characteristic in this respect, the reading had been exiled here in the second half of the XVII century, Patriarch Nikon's "Life in the Ferapontov Monastery scanty votchinka him a small and impoverished krestyanishki to end." Nikon stay in Ferapontovskoy link, which lasted from 1666 to 1676, also contributed to the ruin of the monastery. Exiled here after the deposition of his church council, Nikon did not want to be with his fall and demanded retribution itself patriarsheskih honors. This was aided by the uncertainty of his situation. Periods of strong, almost prison incarceration interspersed with all sorts of concessions and exemptions. Disgraced Bishop never ceased to hope for a speedy return, and the convent authorities had to reckon with the whims of a spoiled elder power. Suffice it to say that Nikon's built according to his instructions any special mansion - "many cells zhitey twenty-five", to "go and shoots." On the construction of these cells have spent a considerable sum for those times - 672 rubles. On the orders of Nikon Borodaevskogo lake built of stone artificial island, which had a cross. For table ex-patriarch brought the sturgeon, apples, watermelons. With nine monasteries on its content annually levied all kinds of supplies, and later - the money in the amount of 839 rubles. In 1676, after the death of Alexei Mikhailovich, Nikon's position in the monastery deteriorated. Patriarch Joachim, his longtime enemy, he presented numerous charges, including charges and was in communication with envoys of Stepan Razin. Nikon moved under the strong supervision of Kirillov monastery, where he stayed for another five years, almost until his death. Since the end of the XVII century Ferapontov Monastery was on the verge of ruin. In 1798 it was abolished, and the parish church did. In the XVIII and XIX centuries, the ancient monastic buildings were rebuilt, many of them broke. In 1857, instead of the wooden walls of the monastery was surrounded by their low fence, partially preserved to this day. At the beginning of this century, in connection with the 500th anniversary of the founding of the monastery opened again briefly, but as a female. In preparation for the opening of a new perestroika started, paused the intervention of the Imperial Archaeological Commission. At the same time attracted the attention of scholars wonderful painting of the Nativity Cathedral, which was dedicated in 1911 published a monograph, VT St George. In 1908 - 1915 years in the monastery were significant reconstruction work completed as early as the 1920s. Restoration study was initiated by outstanding experts in ancient architecture, PP Pokryshkin and KK Romanov, directly supervised the work of AG Walter and later VV Danilov. Particular attention was paid to the frescoes of the Nativity Cathedral, which is partially strengthened. After this restoration work ceased for a long time and were resumed only in 1970. Ensemble of the Ferapontov Monastery Monuments XV - XVII centuries with mural paintings of Dionysius in 2000 was included in the UNESCO World Heritage List. Here is a branch Cyril Belozersky Historical and Architectural Museum Museum of Frescoes of Dionysius. Church of the Nativity of the Virgin was the first stone building not only the Ferapontov Monastery, but the entire White Lake region. Built in 1490, six years earlier Cyrillic Cathedral of the Assumption, he has with him a lot of similarities. The internal structure with high arches under the drum, the completion of the quadrangle of the temple three tiers of corbel arches, each of which came out in front of three kokoshniks, equally spaced ornamental belt, which included the same Balyasnikov and ceramic tiles with floral ornaments, with a promising portal keeled completion, hewn out of natural stone, and many other common techniques show close relationship of both architectural monuments, possibly built by one craftsman. However, when the similarity of their decorative techniques architectural image is very different. In contrast to the massive, somewhat stocky Assumption Cathedral, crowned a huge stone bowl and creates the impression of heroic strength, Church of the Nativity of the Virgin has a light, graceful proportions, accentuated statement of the building on the basement, and ends with a graceful little drum. Particular attention is paid to the builders west facade, decorated with his passing over the cap next to the additional ceramic tiles depicting fantastic animals, and filling the entire field of brick uzorochem zakomar. Other facades are decorated more modestly. For example, framing the southern and northern portals consist of several brick ledges, as it were still in the pre-Mongolian architecture. But even here, the builders of the cathedral is very scanty means, to include laying ceramic baluster gave portals that special elegance that marks the architecture of the cathedral. Another difference from the Assumption Cathedral is the second device, the snare drum with the head of the south-eastern corner of the cathedral, where the chapel of St. Nicholas. We do not know exactly when the church was surrounded by stone porch, but by the middle of the XVI century, they certainly existed. Porch later than the cathedral, it follows from the fact that they are composed of different bricks and shtraba punched in the device of their roof, on the west facade of the cuts the pictorial composition. The porch immediately built bunk. The bottom of it was dull, above the western and southern sides of it had the appearance of a vaulted gallery with large, grouped by two arches. Covering the porch was poschiptsovym: each fence walls of the cathedral in line with their own cell gable roof. The northern part of the porch was separated by a wall and instead of large arches had small windows. In the north-west corner of the top before there was a tent for hours, which was a narrow stone staircase. Outer wall of the tent a little carried forward to the stone consoles that have been preserved to our time. In the interior of the wall next to the stairs lined vertical shaft where the fell hour weights. Later on the face of the cathedral has changed. First, on the south side built a chapel Martinian later in the temple rastesali windows, hipped roof, arranged, shut down the tiers of corbel arches, crowned with fanciful Baroque drum head, a broken arches of the porch and the upper walls of the tent with time, the southern part of the porch rebuilt in the vestry. At the time held at the beginning of this century restoration work restored the original shape of window openings. 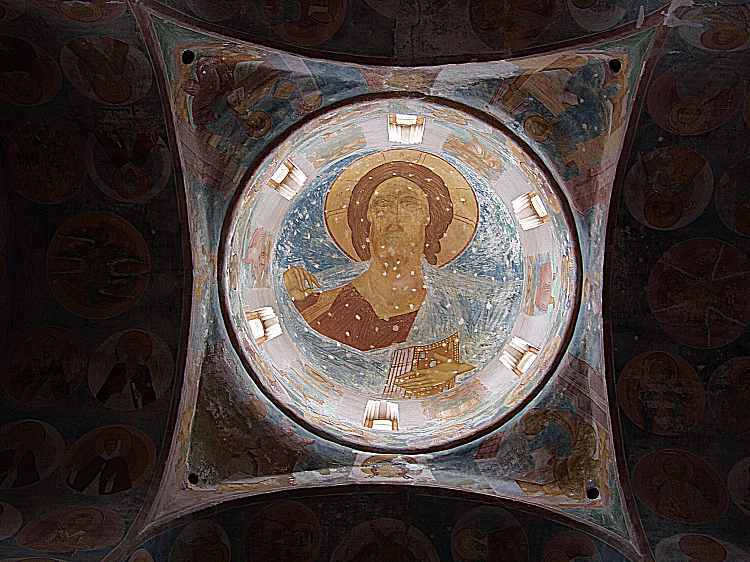 Cathedral of the Ferapontov Monastery became world famous for surviving it murals of Dionysius. Glory of the wizard has been great. They called him "a wise and graceful painter," his icons along with the works of Andrei Rublev became the subject of the gathering at the beginning of the XVI century, noted especially in monastic inventories. The membership ferapontovskih murals Brushes Dionysius says preserved over the northern door of the Cathedral an ancient inscription, which ends with the words, "a scribe Deonisie Ikonnikov with their chady. O lord Christ, King of all, deliver them, O Lord, eternal torment." This signature masters - a rare phenomenon in the Russian art of the time, it indicates a high consciousness of the artist. "Chady" Dionysius, mentioned inscription - it is his sons Vladimir and Theodosius. Other works of Vladimir did not reach us, as we know them only by a mean row registers. Theodosius also was one of Moscow's leading painters in the first third of the XVI century. In 1508, he led gang painted a grand Cathedral of the Annunciation of the Moscow Kremlin. Theodosius also wrote excellent miniatures of the Gospel in 1507 of the Public Library. Art historians have repeatedly made attempts to isolate the hand of each of the three ferapontovskih masters. However, this problem nobody could solve. It has been suggested that it is undecidable in general and that all three work together to master each song, dividing the work among themselves, which explains the striking similarity of style is, how different painting. Technical and technological research in recent years have given new factual material may bring us closer to solving this problem. Found a difference in the selection of pigments and methods of writing in different parts of the temple. It is striking how the speed of painting. Observations on the stucco seams indicate that her entire lower tier, but the altar was made in five pieces of plaster. This means that when working with water colors on wet plaster, the master must have been for five days, at least, to carry out design of all the songs and make the main seal in color. On the largest of these sites is shown figure 33 and 44 face! There is no doubt that the leading role belongs here to Dionysius as head of the farm. The inscription on the wall of the cathedral was half obliterated date, which caused controversy among experts. Currently, all agreed that stenopisnye work continued for 34 days, from August 6 to September 8, 1502 (this date was first proposed by scientists Vologda NI Fedyshinym). By this time, Dionysius was already famous. Back in 1482 he headed the gang, had written icons for the iconostasis was built shortly before the Assumption Cathedral of Moscow Kremlin, the main church of Muscovite Russia. This is a recognition of Moscow's leading master of Dionysius. The paintings of the cathedral of the Ferapontov Monastery is the most inspirational piece of this wonderful master. The paintings are generally quite well preserved, but to correct idea of ​​its original color scheme is necessary to consider some changes in colors that have occurred over time. Blue backgrounds and white-green manure initially looked darker and richer in color. Experts still have not reached a consensus on the red color in the painting: was it more intense. In any case, all the paintings were originally brightly. However, the extensive use of Dionysius and razbelennye paint, especially in the depiction of architecture and slides. Combination of tight clothes and transparent colors backgrounds attained a special decorative effect: color patches figures clearly stand out, they acquire a special role of the contour line, carrying always a great meaning. Symmetrically placed bright spots of color create the impression of balance, stasis of each scene. The impression of the wealth of color Dionysius reached purely pictorial means, having a relatively small amount of paint pigments. All or almost all were imported. A beautiful legend about Dionysius, collecting colorful pebbles on the shore of Lake Borodaevskogo for preparation of its colors, is not more than a legend. In ferapontovskih most striking paintings in art composition. This applies to every single scene, and to accommodate all the paintings in general. The compositions of individual scenes, usually centripetal, closed within itself. Flexible lines of the drawing the viewer's eye movement organized, do not go beyond the stage. Bent toward each other figure, flowing gestures, laconic lines of the figure form a dimensional linear rhythm. This rhythm is enriched with certain interruptions, in a woven architectural backgrounds, always strictly proportionate figures. As strictly and logically organized system of painting the cathedral as a whole. Dionysius is based on the articulation of architectural interiors, subjecting them to the size and proportions of the beautiful songs. This achieves a harmony of architecture and painting, light visibility scenes. It has consistently held the idea of ​​consecration of the temple of the Virgin. This topic opens in the outer western wall paintings of the cathedral, where the composition is a central place, "Nativity of the Virgin." Inside the cathedral dedicated to Our Lady of the scene occupy the most responsible places. In the large lunettes - this multi-figure compositions, "Protection of the Virgin," "In Thee rejoice," "What will bring Ty?" On the cheek of the eastern arch - "Our Lady of the Sign", in central apse conch of the altar - The Virgin and Child on the throne. The whole story mural illustrations allotted Akathist Dame. Akafistny cycle begins on the inner faces of the eastern pillar, which has four songs, "Annunciation" - a kind of a small opening suite, and then continues on the interior faces of the pillars of the West, thus completing the circle of the dome of the temple space. The narrative moves in a south-west, then north-west corners of the cathedral, and, finally, forms another wide circle, following the south wall, the outer edges of the pillars of the western and the northern wall.